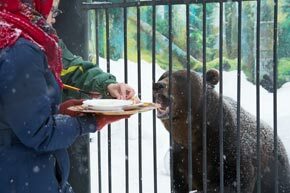 Bear eats traditional Russian Pancakes with honey during Maslenitsa in the Nizhny Novgorod zoo on March 15, 2013. Bear eats traditional Russian Pancakes with honey during Maslenitsa in the Nizhny Novgorod zoo on March 15, 2013. Source: Oleg Zoloto/RIA Novosti.